Eric received his Bachelor’s in Exercise Science at the University of Toledo and went on to receive his Master’s in Physical Therapy at the University of Findlay. He has special certifications in Integrative Dry Needling, CHVLAT Joint and Spine Manipulation, LSVT BIG Therapy, Titleist Performance Institute for golf/mechanics analysis as well as an extensive background in balance and vestibular therapy. He has a combined 14 years of Physical Therapy experience including licenses as a Physical Therapist since 2009 as well as worked as a Physical Therapy Aide for 6 years while he was attending Physical Therapy School. Eric is married to his wife Kelly and has 3 children Zach, Luke, and Kensley. He enjoys all sports, Notre Dame athletics, spending time with his family and his job. He feels he has the privilege to work and meet all sorts of people and feels so honored to help them every day to make them enjoy their life with little to no pain or help for whatever their goals may be. Our multi-system and innovative form of treatment at PT Link sets us apart due to our variety of treatments we offer at all of our locations. 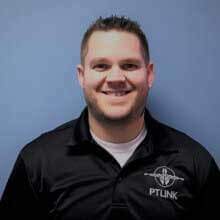 We have an amazing team at PT Link that enjoy their jobs. As always we are all here to help you so let us help you in your journey to be the next PT Link success story! !